Cess income declined by 13% to $285.78 million relative to $330.23 million the previous year. Fee income grew by 34% to $611.56 million to close the year, compared to $457.52 million in 2016. E-campus showed an increase of 12% to $15.92 million, relative to $14.22 million in 2016. Other operating income rose 22% during the period to total $77.89 million compared to $63.82 million in 2016. Staff cost increased 6% to total $289.49 million for the period (2016: $273.44 million). Depreciation and amortization totalled $37.39 million for the year relative to $25.78 million in 2016. Professional fees amounted to $52.47 million (2016: $45.19 million) a 16% increase year over year. Property expenses climbed $24.14 million to $119.34 million (2016: $95.20 million) during the year under review. Other operating expenses grew by 30% to $48.31 million from $37.17 million the previous year. Advertising and promotion was up by 26% from $48.49 million in 2016 to $61.19 million. Securities commission fees posted an 11% decline year over year to close at $40.39 million (2016: $45.62 million). Investment income fell to $16.32 million (2016: $51.81 million) for the year end. Finance cost for the year amounted to $1.20 million compared to nil in 2016. Profit before tax totalled $338.05 million compared to $334.74 million the year prior. Tax charges for the year totalled $117.38 million (2016: $111.15 million). 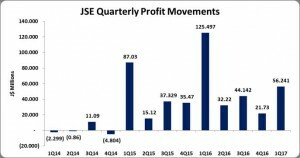 Consequently, JSE reported a net profit of $220.67 million compared to a profit of $223.59 million in the prior year, a 1% decline year over year. Net profit for the quarter amounted to $71.49 million (2016: $21.73 million). Total comprehensive income was for the year amounted to $242.80 million relative to $351.37 million in 2016. Earnings per share for the quarter totalled $0.10 compared to $0.03 in 2016. EPS for the year ended December 31, 2017 was $0.31 compared to $0.32 in 2016. The numbers of shares used in the calculations are 701,250,000.00 units. JSE stock price closed the trading period on February 27, 2018 at $6.45. As at December 31, 2017, assets totaled $818.74 million, a 10% increase when compared with its balance of $741.15 million a year prior. The increase was due to a 29% increase in Property, Plant & Equipment’ from $240.05 million to $309.51 million. Shareholders’ Equity amounted to $643.90 million (2016: $593.41 million), resulting in a book value per share of $0.92 (2016: $0.85).